As usual I haven't managed to stick to one of my self imposed deadlines; at least I was close for once! When I intended to post this review there were 6 badges to talk about and somehow we finished with 12 badges across 11 beers... Anyway, I hope you enjoy it and find a beer you want to try! I had high hopes of making the beer that unlocked Birthday Brew (Level 4) the first beer I've reviewed in full in months. Alas Grand Final Weekend intervened... 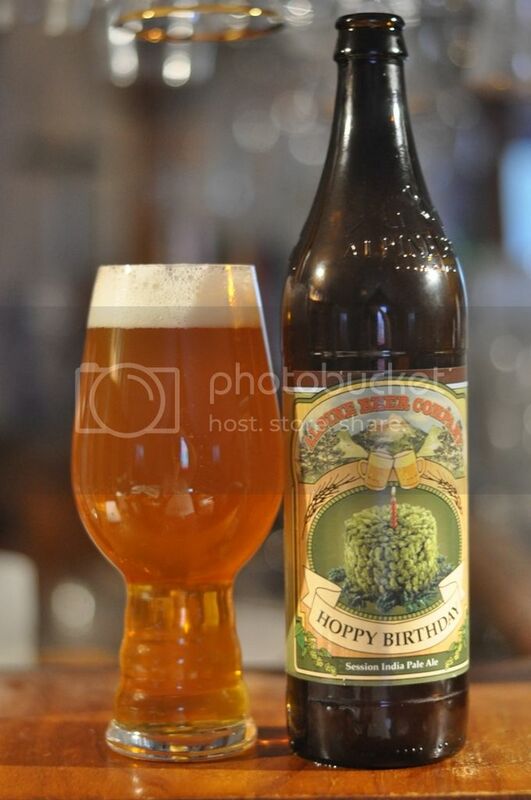 The beer was, somewhat fittingly, Alpine's Hoppy Birthday. It was wonderful! With a cavalcade of citrus and tropical fruit flavours coming from the hops complimented by heaps of pine. It's one to look out for, although freshness would be key. Levels of 2X, the badge for drinking "Imperial" beers, are getting knocked off very rapidly. (Level 5) was unlocked by Stone's 20th Anniversary beer, Citracado IPA. Like almost all Stone beers, this was incredible! It was naturally a big hop forward Imperial IPA, with plenty of citrus and floral characteristics coming from the Citra hops. There was a sweetness, that I later found out was from Avocado flower honey (hence "cado" in Citracado). It's both excessively hopped and excessively malty, but somehow pulls it all together into a well balanced, if quite big, finished product. Regular readers would be aware of my love of Black IPA's. Moor's Agent of Evil ticked a lot of boxes for me and unlocked Hopped Up (Level 47) in the process. This beer had everything I'm looking for in the style; nice roasted malts and plenty of hops. The hopping was far more reminiscent of an American brewer than an English brewer, with plenty of pine flavour, some light citrus and assertive bitterness. I will have to go and seek our some moor (get it!) Moor beers, this was impressive. Having had a Black IPA, I had to follow it up with another! BrewDog's Black Hammer, the first of the Jack Hammer spin-off beers I've come across, was even better than the Agent of Evil mentioned above! BrewDog don't do things by half measures and this beer was no exception. There was heaps of roasted malt and a wonderful intense mix of resinous pine and pithy grapefruit bitterness coming from the hops. I could happily drink this beer all day! God Save the Queen (Level 35) is why you're reading about it now. A few sours on a Saturday afternoon with Richo, which you may read more about later, turned into much more than a few sours... Somewhere around midnight out came Garage Project's Sauvin Nouveau. This is a beer I've seen heaps of times but always passed on in the past. It's a pilsner that has had sauvignon blanc juice added to the wort. The result is very interesting, with a light vinous element coming through, as well as plenty of fruit. Accompanying this is plenty of hops, all Nelson Sauvin, which provides a nice bitterness and clean finish. It's a fascinating beer and one I would like to try on a fresher palate; Crisp as Day (Level 17) was the badge. You're Extra Special (Level 3) is a badge that doesn't come around all that often for me. I'm not huge on E.S.B. 's but they are certainly growing on me. The Loch Brewery & Distillery Best Bitter was the latest one that I tried. It's not a beer that I'd drink regularly, although it's a relatively easy drinking beer. It's driven by a bready malt body with a distinctive yeast element as the beer warms. The hops are the real winners here with restrained citrus the most prevalent, while there is also a stonefruit flavour that I can't quite place. If you're into malt driven English beers, this would be one to investigate. When I read that 8 Wired were making a Sour IPA I knew two things; 1) that I had to try it & 2) that it'd be awesome! Both of these things came true when I tried Palate Trip last night, whilst unlocking Pucker Up (Level 42) & Drink Like a Kiwi (Level 34). This was their GABS beer from this year and I was pretty disappointed I didn't get to try it on the day because I was too sick. It lived up to my expectations with nice tropical fruit and citrus hops being complimented by pleasant, not overpowering, tartness. I would highly recommend this to IPA lovers who are looking to get into sours; it would make an excellent transition beer. Franziskaner's Here-Weisse Dunkel, is one of the best examples of a straight up and down Dunkelweizen that you can find. It's got all of the flavours you'd expect, banana, cloves, vanilla, a touch of green apples and chocolate malts. It's available at Dans nationwide and it's a beer that everyone who loves beer should try at least once. It unlocked that ever confounding badge, New Brew Thursday (Level 24). Take a Dunk is the (relatively) new Untappd badge for drinking different Dunkelweizens. I was surprised it took me this long, over 6 months, to unlock it. Denmark's Hornbeer don't bring many beers out to Australia, but I did manage to get my hands on their Dark Wheat. It was quite a nice beer, although was it significantly lacking in the banana wheat flavour that characterizes the style. There was some nice malts, a bit of spice and a creamy vanilla mouthfeel. We're in the midst of a canning arms race, where every craft brewer is trying to get their wares into cans. Six String, a brewery on the NSW Central Coast. have always canned their beers including their Hefeweizen, a style very rarely seen in cans. It's another good, if not excellent, example of the style with plenty of banana and cloves. It was perhaps a tad overcarbed, with the head taking a good 5 minutes to calm down. In any case; it drank well and that's what matters! Hefenista (Level 9) is why you're reading about it. I think I might have to make a no drinking new beers rule when I'm writing these Untappd Catchup posts; they have a tendency to get out of hand... In any case, it's finally done! I'm hoping to finish the new installment of The Thirst tomorrow, I've just got to finish going through my emails that I've received on the subject. My first full review for ages is partly written as well, so with any luck that will be up before my exam next Thursday. Keep the emails and questions coming guys!